To us and a mirror. The anthropologist Claude Lévi-Strauss wrote that "animals are good to think with." This exhibition examines the ways in which the artists, writers, and composers represented in the Morgan's collection used animals to think and create. What does the portrayal of animals in images, words, and music reveal about companionship, meaning, and morality? About science, beauty, and truth? Ancient seals, drawings, prints, books, music, and medieval and literary manuscripts illustrate the role of animals as symbols, teachers of moral lessons, aesthetic and scientific muses, talking creatures, and companions. Included in the exhibition are works by John James Audubon, William Blake, Eugène Delacroix, Albrecht Dürer, T. S. Eliot, Ted Hughes, George Orwell, Jackson Pollock, Sergei Prokofiev, Rembrandt, E. B. White, and Virginia Woolf. 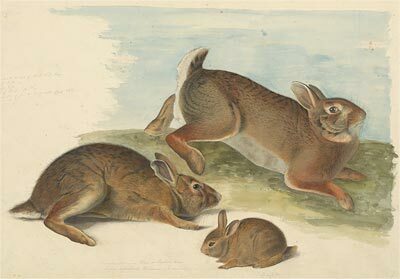 In the Company of Animals is organized by Clara Drummond, Assistant Curator at the Morgan Library & Museum. This exhibition is supported by a generous gift from Tina Santi Flaherty in honor of her faithful companions Jackie, a white Labrador retriever, and Scarlett, a King Charles spaniel. Additional assistance is provided by the Janine Luke and Melvin R. Seiden Fund for Exhibitions and Publications and by Jeannette and Jonathan P. Rosen.